As I noted in my last post, the good stuff is going in. After 8 years of sawdust and open walls, things will start to come together. The good thing is I know that all of the systems and mechanics are brand new and hopefully will last another 80+ years. We left off here. 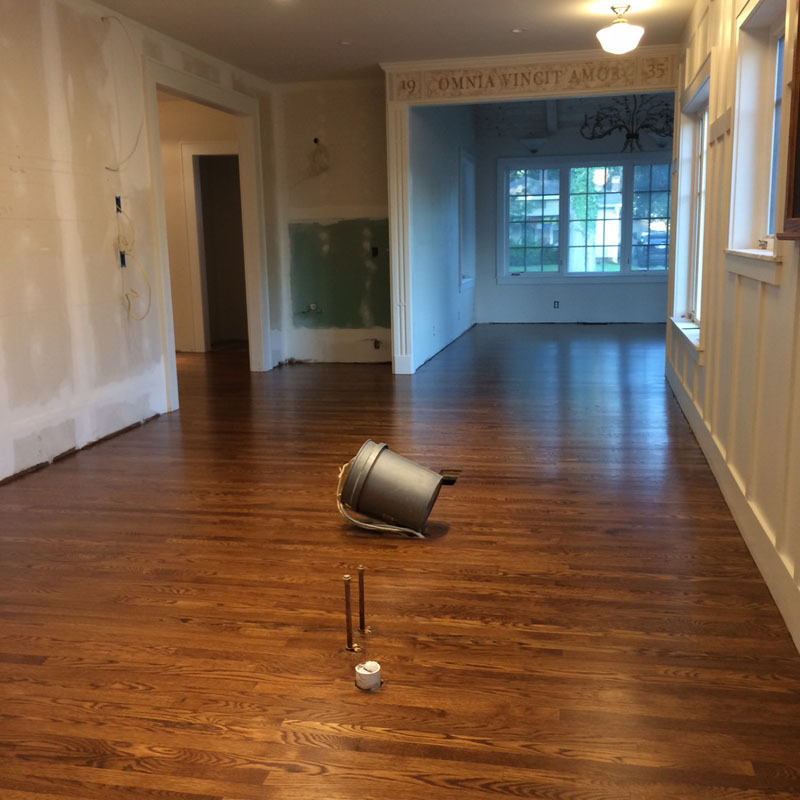 The 2 1/2″ white oak floors are being installed. I contracted this project out – mainly due to time. I’m working on the upstairs to try and finish this year. Wide white oak floors go up there, and I have a lot to do. Besides, I know these will be done on a level better than I could do. Stained and with 2 coats of clear, it’s time for me to get my baseboard cap on and put in some trim. This is the kitchen area to be. The bucket holds all of the electric and controls for the in ceiling speakers. A central island will be 14′ long on two levels. The space is 40′ long from the back door to the sunroom wall. 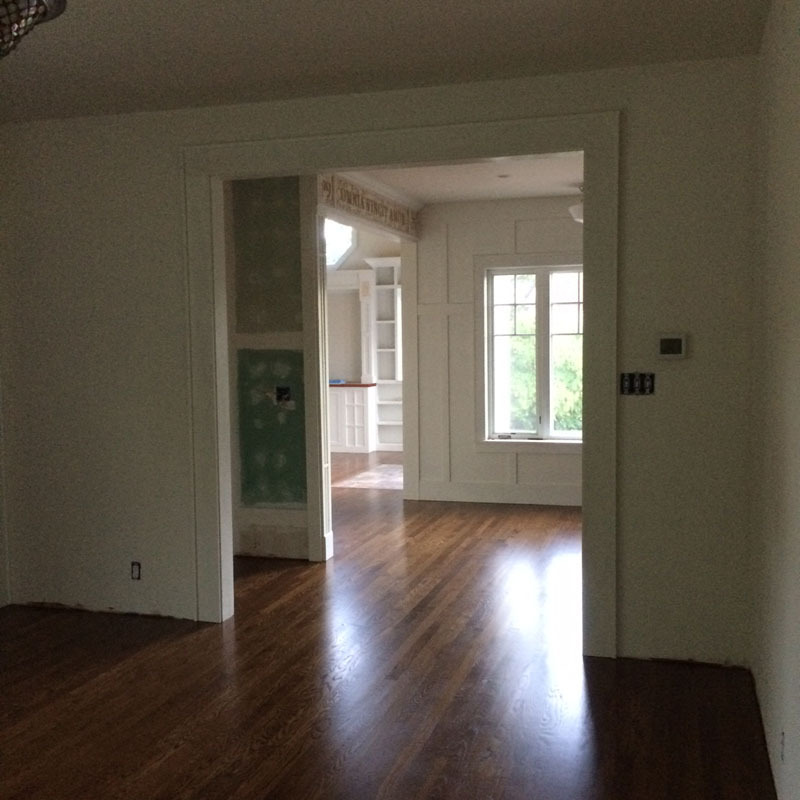 I’ve got to finish the fireplace install and a final coat of paint on the fireplace – and baseboard trim and we’re almost finished in this room. 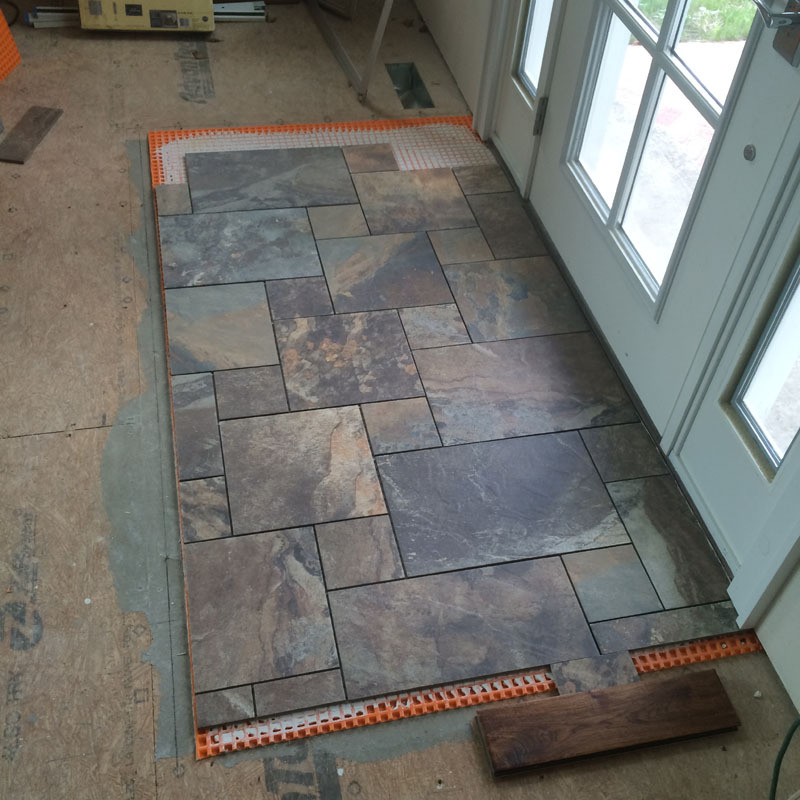 I put porcelain tile down at the two entrances next to the wood floors. I wanted to keep water off of the floors to make the finish last a little longer. 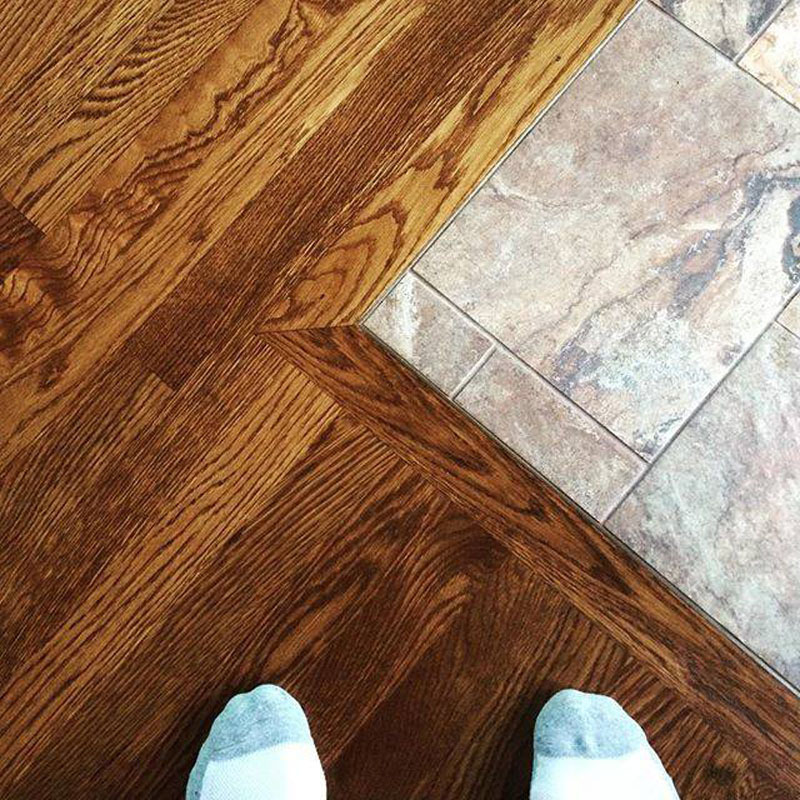 So here is a picture of my sock feet this morning, walking on my newly finished floors. So much more to do, but we’re headed in the right direction. Stick around, something’s bound to happen. 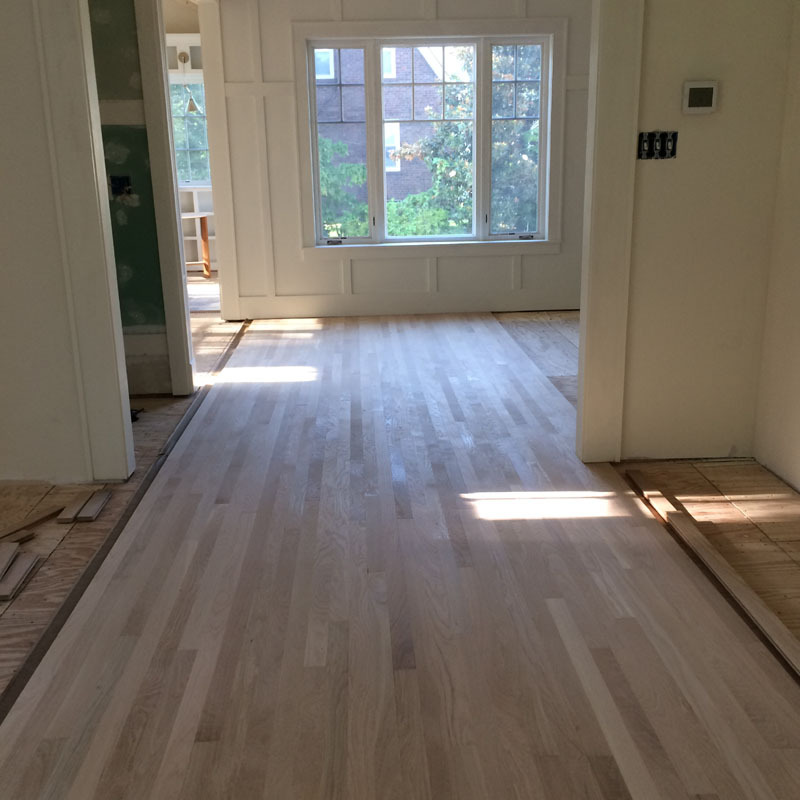 This entry was posted in Floors and tagged 1930's bungalow, DIY Home, hardwood floors, Home Renovation, oak floor, Old Home Renovation, Remodeling by curt. Bookmark the permalink. That’s a really nice looking floor. How long did it take for the entire process? I’m impressed it was dry so fast. Any word from your neighbors on wrapping up your house renovation? WOW–those floors!! 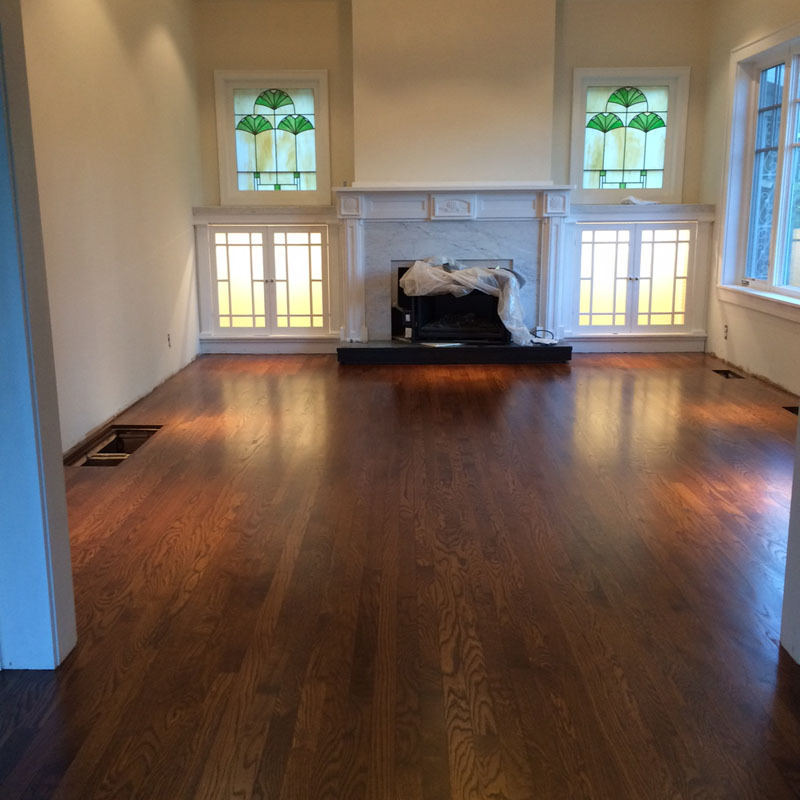 I remember back in 2004 when I first walked on my refinished original fir floors. I was so awed that I just sprawled out right in the middle of the empty living room! Thirteen years and three boxers later … not so impressive anymore! May yours last longer. Looks great! You must be chuffed to bits. Your sock feet add a touch of the Real, and I was wondering what you did in the gap between floor and stone. I’m about to order stone for a hearth and will have the same detail. Would love to know how you cracked that nut!